Long relegated to ethnic dishes and often categorized as that strange thing your Grandma tried to make you eat at Sunday dinner, the beet made a comeback in 2011 and popped up on menus across the country. While most food experts agree that the beet’s time in the spotlight has passed, it would seem the beet isn’t quite ready to let go of the limelight. The beet may be last year’s news, but its juice is still taking center stage. Known for its rich red color, beetroot and beets have been around since pre-historic times, growing wild in Europe, Asia, and North Africa. Although originally only eaten for their greens, the root of the beet can be eaten as well or used to create beet juice. 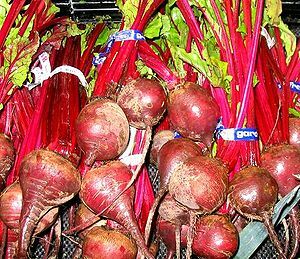 Beets come in several varieties including red/purple, white, and rainbow colored. Whether eaten or used in juice, beets provide a bounty of nutrition which is one of the reasons beet juice is being touted as the health drink of the moment. Additionally, beet juice is a great source of polyphenols, a type of antioxidant that is very beneficial. Research into the benefits of beetroot juice conducted at Barts and the London School of Medicine has shown that even a small amount each day can reduce blood pressure. These findings also indicate that beet consumption may help prevent cardiovascular disease. Other research completed at Wake Forest University shows that beet juice can boost blood flow to specific parts of the brain. This finding is significant because it opens the door to potential treatment options that may slow the progression of dementia and other cognitive dysfunctions associated with the degeneration of that area of the brain. Here in Arizona, fresh locally grown beets are easy to come by and offer many options for filling your plate while boosting your health. Here are some of our favorite beet recipes. If you want to get the benefits of beets every single day, just make your own beet juice. Here are some ideas for making great tasting and heath boosting beet juice. This entry was posted in Arizona Food and Farm Events, Recipes and tagged Beet, Beetroot, Carrot, Chard, Goat Cheese, North Africa, Olive oil, Wake Forest University. Bookmark the permalink.